We have all seen the commercial by now for the locos tacos from Taco Bell. It is a Dorito shell with the usual taco stuff inside. It is easy to be grossed out and want one at the same time. I attempted making my own version seen here on Matt's plate. 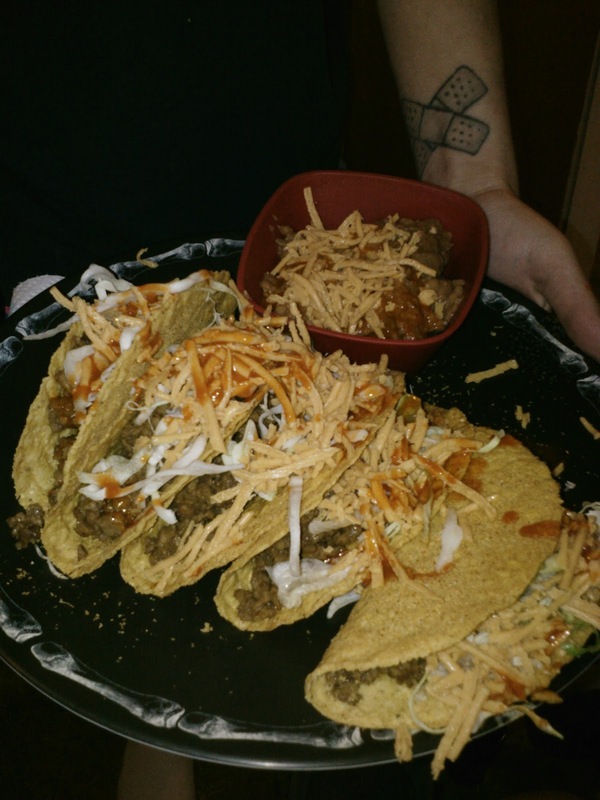 I served it with a little bowl of refried pinto beans with hot sauce and cheeze like Taco Bells makes. Well, my Dorito spice mix needs to be adjusted the chip - taco combo was there but it needs more kick. The tacos were a bit darker in person - but not as red as the ones on the TB commercial. Basically I made a seasoning of nutritional yeast, paprika, salt and garlic powder. I tossed the shells in the oven - since they contained coconut oil I waited a few minutes for the oil to release, pulled them out and sprinkled them with seasoning on one side.After putting them in the oven for another few minutes I pulled them out, flipped them and sprinkled more seasoning on the 'naked' side and baked another minute. The shells turned a golden color. I am sure you can spray cooking spray/oil on the shells, sprinkle/dunk the shells in the spice mix and then bake. However I did not want to get super oily here and tried this method...It worked! The filling was soy crumbles cooked in a bit of vegetable oil, lettuce, Daiya shreds, hot sauce! Next time I will play around with the seasoning to get a more vibrant color and kickier taste. I assume Doritos get their color from food dye and MSG! I never saw the commercial but I am sure yours kicked TB tacos to the curb. What kind of tacos do you use that has coconut oil in it? "It is easy to be grossed out and want one at the same time." Resonates with me! This is pretty brilliant and I definitely want to try it! Yum, that looks like a great plate of food. Yummo, I want those tacos! Every time I see a commercial for those tacos I think that Garden of Eatin' needs to come out with their own version of those taco shells. Their Pico de Gallo chip is my husband's very favorite, and it's similar to Dorito's but a lot more natural and vegan. I like it that you tried your hand at making your own! Those look damn good! Tacos are my favorite.